Are you located in Northern Ireland, the border counties of Ireland or Western Scotland? Do you have a new product you want to bring to life? We can help you develop a partnership, register your interest here. Have you got a great idea to develop an innovative product or service, but it is just too big for your company to manage alone? Do you lack some of the skills or funding to make the idea a reality? 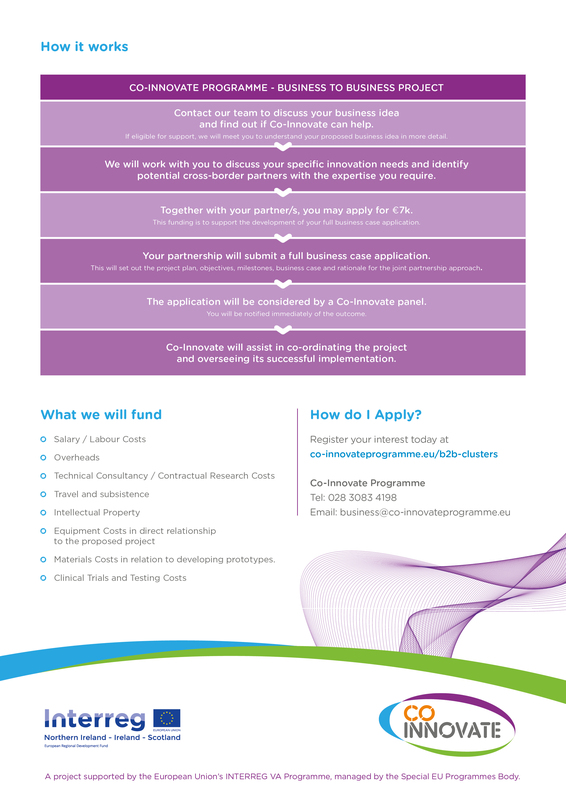 Co-Innovate’s Business to Business and Cluster partnership programme can provide your business with the opportunity to form a strategic cross-regional Research & Innovation partnership to accelerate product development and improve your business's competitiveness. All partnerships must have at least one partner based in ROI’s border counties and one partner based in NI/Western Scotland. Click here to view more. If your business has an innovative idea with strong commercial potential and has found, or is searching for a strategic partner to make it happen, this programme can help. Co-Innovate is looking for ambitious businesses across the island to collaborate and form a strategic innovation partnership with another company to get great products, services or processes off the ground. Companies that take part in Co-Innovate can benefit from pooling their expertise and resources to bring their innovations to market faster than if working alone. If your business is interested in a specific area of activity or research but the project just seems too big for your business alone, then creating or joining a Cluster Partnership may be for you. Each Cluster which is supported by the Co-Innovate programme will involve a group of companies and at least one academic partner (a minimum of 3 business organisations). Funding provided will be for a very specific purpose and the results of the cluster activity will have some identifiable and measurable impacts for each partner. Specifically, a business network is likely to result in enhanced competitive advantage and/or mutual financial gain. 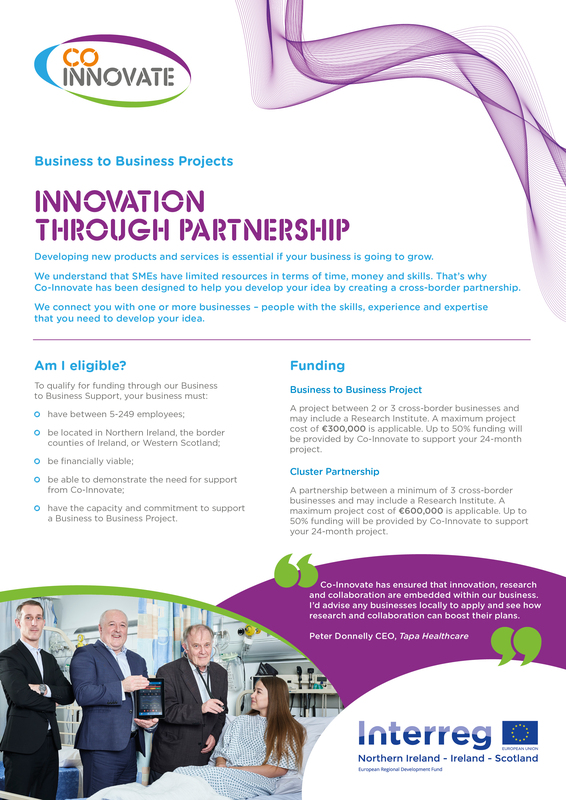 Funding up to €300,000 (up to 50%) per Business to Business Partnership is available to support your 24-month project. Funding up to €600,000 (up to 50%) per Cluster Partnership is available to support your 24-month project.